We’ve been home almost a week now, I went straight back to work, Lolly had the remainder of the week off before starting her new job. It’s the longest trip we’ve done in the van both in distance (just over 2000 miles) and time (21 days), I thought it would be a good idea to write down what we would do differently next time and things we (mainly me) would like to do to the van for our next adventure. 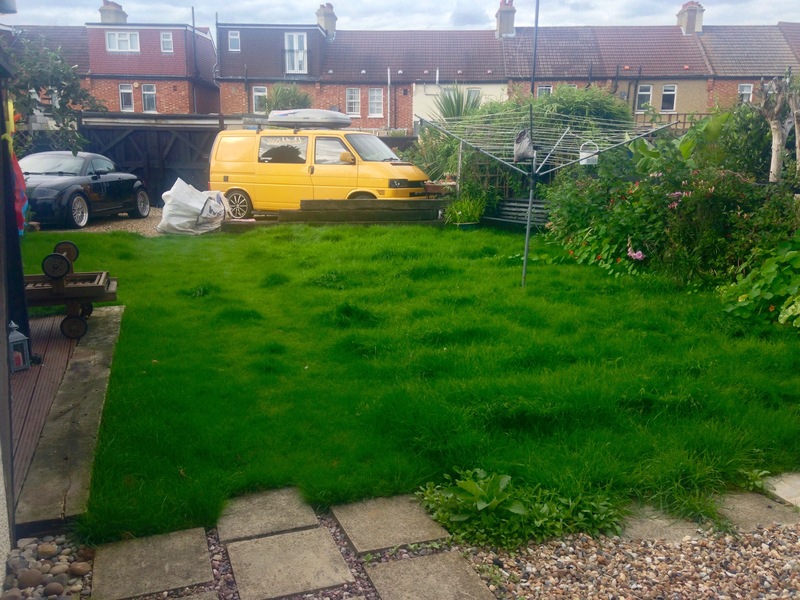 I also need to cut my grass! We both agree that whilst it was nice to move about and see different places if we do it again, we’ll get as far as we want to go and then stay there for a while, maybe spend a couple of days getting somewhere, hold up for a week, then move on somewhere not too far away, stay there for more than a couple of nights, less moving the better. It’s a pain packing up the van every other day, taking all the thermal curtains down, putting the bed up, moving the surfboards from the back to the front and then back again when taking off, it would be much easier if we could arrive, set up camp and then leave it like that for a bit. I doubt we’d take much less, maybe less clothes (especially if we head back to Montalivet) and i’d deffo find a better way to store the body boards as they take up a lot of room in the van, there are a couple of things i’d take next time for sure. I will definitely have on board a reverse polarity adapter for the 240v hook up. We came across this twice, once in an aire and once at a campsite, from what I have read a lot of the Flot Bleu aire’s are wired up reverse which could wreak all sorts of havoc on your electrics, luckily our PMS 3 has a reverse polarity indicator. I’d like to see if I could get another top box on the roof, in there i’d put all the bedding and one of those fold up table and chairs for when we eat or just wanted to sit outside the van. Solar, I definitely want a solar solution for the leisure battery, whilst I enjoyed staying at the campsites with all their facilities I also really enjoyed staying at the aires, most of which had no electricity supply. I could keep the fridge going for a lot longer which would mean Lolly would have ice for her G&T’s (plus the ice won’t melt and flood the fridge), i’d have cold beers and our food would keep, the split charge kit has massively helped keep the charge up when on the move as has rewiring the fridge. A pop top, i’ve never really seen the point of them until I saw Dickie and Julias van, I really liked the fact that they didn’t have to fold down their seats in the rear when it was time for bed, they just popped the roof, put their duvet and pillows up there and climbed up to crash, they also have a sunroof so I wouldn’t have to ditch ours which is a feature I really like. I would however have to revisit how the top box attaches to the roof, rails bolted to the pop top would do the job. An awning, more for rain than sun, it does sometimes rain when cruising about the place in summer and to have a shelter to sit under while nature does it’s thing would be much nicer than having to sit in the van with all the stuff we just chucked in to prevent it getting wet ! Curtains, Van-x preferably, our just kamper thermal curtains are great but they are annoying to deploy, lots of licking and then occasionally falling down in the night, curtains for the rear and two side windows would be great. We really enjoyed France and both feel we have a lot more to explore and will definitely be going back, we’d both really like to do a similar trip in Spain and then maybe Morocco, dreams for now but you never know ! There is a part of me that looked enviously at the size and space the huge motorhomes had that we were frequently parked up next to, also having your own toilet and shower means you could do a whole trip without ever going to a campsite using just your own facilities, what puts me off is pretty much all of the owners had upwards of 20 years on us, we’re not ready to roll with the olds, we’re still reasonably young and happy being in the cool crowd with our lovely yellow T4 !